How long have Roma been using Facebook and Twitter? Roma started using these channels the first week of October, 2011, a week after I joined the club as the Digital Business Director. Hard to believe, given the fact that AS Roma is one of the world’s top teams, but prior to our arrival there was only a brochureware flash site, no eCommerce and no social media. In a little over six months, we have launched Facebook with over 1MM fans, Twitter, YouTube, Pinterest, the AS Roma Dream League, and online AS Roma Membership, the AS Roma Fantasy Manager on iTunes and Facebook, a new eCommerce Site (asromastore.it), and the biggest project of all, our new main team site, asroma.it. How does the club use Social Media to engage with their fans? We view social media as the ideal platform to engage our fans. Providing great original content in the form of backstage pictures and videos, breaking team news, practice reports, but also exclusive promotions or the chances to interact with players all serve to foster this engagement. The key to social media is providing entertainment and allowing a conversation to happen. We try not to over-moderate, and we interfere if called upon (we try and answer relevant Tweets, etc.) Our fans appreciate the content, the videos and they are sharing our content with friends around the world – it is this virality that has allowed us to grow rapidly. Q3. What value does Social Media provide to the club? Everything is connected. The more fans interact with the brand and spend time on our site, the more it helps the AS Roma brand. Over time we monetize with eCommerce, ticket sales, AS Roma Membership Program and our early forays into social gaming and Apps. But it all starts with giving the fans the place to congregate, comment, interact and enjoy themselves online. Eyeballs on the site means that fans enjoy the experience and are entertained. It also means they will be monetized via ads or commerce, and this helps us grow new revenue streams. What has been the best experience on Social Media since the club has started using it? This is the hardest question I have faced while being at AS Roma because there are too many to choose from. Early on we got our legend, Francesco Totti to pose on a training table while giving the thumbs up – and this photo was picked up by newspapers everywhere. 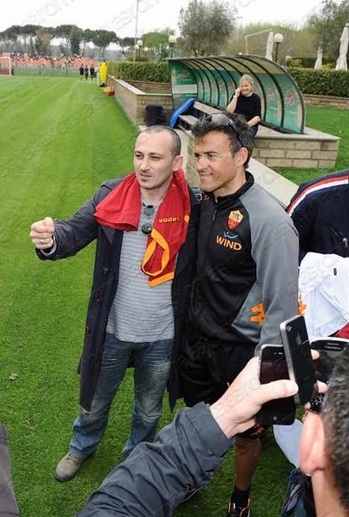 We had a fan photo promotion where we featured the best photos of fans wearing the Roma colors around the world. Just last week, we organized a fan appreciation video and photo where our team thanked the fans for reaching 1MM – certainly a great highlight. But I think nothing beats the simple joy of having given these great fans the platforms and the content for them to interact every day. What has been the most challenging aspect of using Social Media? We are still at Day 1 in getting the overall organization and team behind it. Twitter is still not heavily used in Italy, and our main Twitter stars are foreign players. Few players even have their own public fan pages on Facebook. I would like to see this medium grow as rapidly as it has in the US, but I’m proud to see AS Roma already ahead of most Italian Serie A teams. With the club already using Facebook, Twitter, YouTube and even Pinterest – what is next for AS Roma? Well now, what fun is life without surprises? This whole experience has been like Santa Claus popping in every few weeks and dropping gifts around the world to AS Roma fans excited to open their digital toys and play with them. We certainly are looking to add more Apps and games, and as other social platforms emerge, we will be there if it makes sense for us! AS Roma are certainly a club to watch in the next few months, and as more clubs invest and improve their Social Media offering, Roma will undoubtedly be in a better position as an early adopter. Our thanks goes to Shergul and the club for taking the time to respond to these questions. Previous story Football Clubs and Blogger Outreach. Where is it?